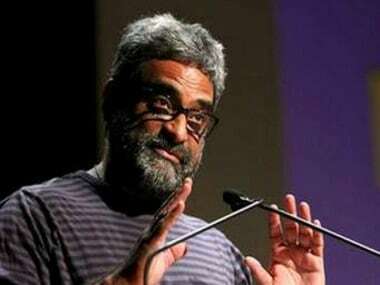 Mumbai: Writer-director R Balki, who has worked with megastar Amitabh Bachchan in all his four films, says he would love to work with Shah Rukh Khan and Salman Khan provided he gets the correct idea for them. "I want to work with all of them, but the idea should be there. I'd love to work with Shah Rukh (Khan), love to work with Salman (Khan), but the thing is you have to get the correct idea for them," Balki told IANS in an exclusive interview. "Who does not want to work with them (Khans)? But there's no point in me working with them unless I really get an idea, then I chase them and ask them if they want to do it," he added. Balki's wife Gauri Shinde, after her debut venture English Vinglish, is presently busy working on her next film which stars Shah Rukh Khan and Alia Bhatt. Balki said that his wife wishes him to become "at least 10 percent" of the characters he presents in his films, like Kabir from his latest film Ki & Ka. "Gauri always says, 'I wish that you could at least become 10 percent of the characters that you write. Why can't you be like Kabir? Or like others?' I always tell her that if I would become my characters, then why would I write them. I'll always write what I am not. I never write what's there in life, but what I want to become in life," Balki said. "Like we think, this is how a man or a woman should be, every writer has qualities of both male and female. So whatever he/she wishes, they write that, not what they really are, but what they want to be," said the director of Ki & Ka. Balki is always known for his unusual stories, like a househusband in Ki & Ka, a father playing a son to his real-life son in Paa, a love story between an older man and a woman half his age in Cheeni Kum and a mute man talking with the help of innovative technology in Shamitabh. Megastar Amitabh Bachchan featured in all of Balki's films, with a cameo in Ki & Ka.